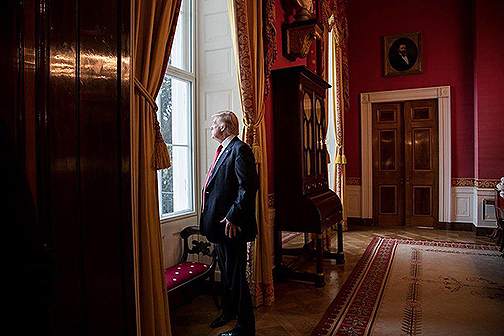 President Trump fulfilled important goals of the Justice Integrity Project and other transparency advocates around the world when he announced on Oct. 21 his plan to release remaining classified documents pertaining to the 1963 assassination of President John F. Kennedy. 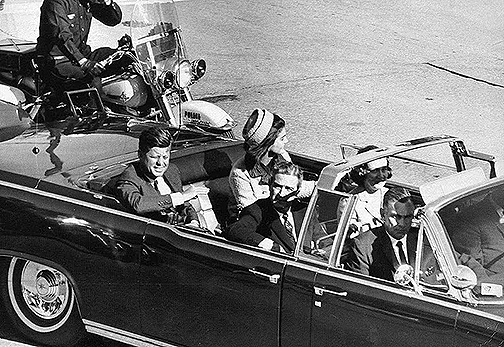 “Subject to the receipt of further information, I will be allowing, as President, the long blocked and classified JFK FILES to be opened,” Trump tweeted on early Saturday regarding the assassination. 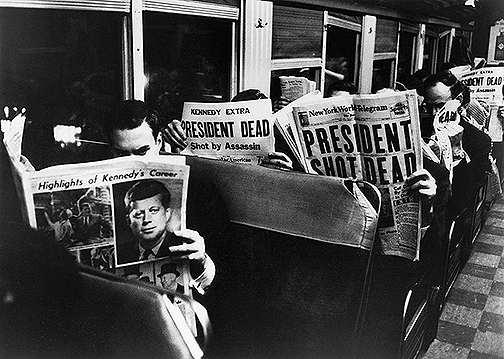 JFK's death unfolded shortly after the below photo was taken of his motorcade in Dallas on Nov. 22, 1963. 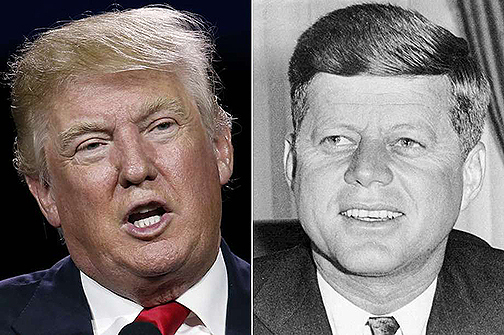 The long-awaited news of Trump's thinking was reported by, among other places, the Washington Post in Trump plans to release JFK assassination documents despite concerns from federal agencies and by the New York Times in Trump Says He Will Release Final Set of Documents on Kennedy Assassination. Both news reports are excerpted below. Citizens Against Political Assassinations (CAPA), on whose board this editor serves, convened by conference call Oct. 21 to discuss the developments. CAPA Chairman Cyril H. Wecht, the prominent forensic pathologist, consultant and author, led the group in reiterating its longstanding support for document release and the applauding the president's "courage" in his action. Wecht, 86, was a county coroner in Pittsburgh for 20 years. A longtime medical school professor and attorney, he still undertakes hundreds of autopsies a year and is the author or co-author of more than 40 books and 500 scientific articles. 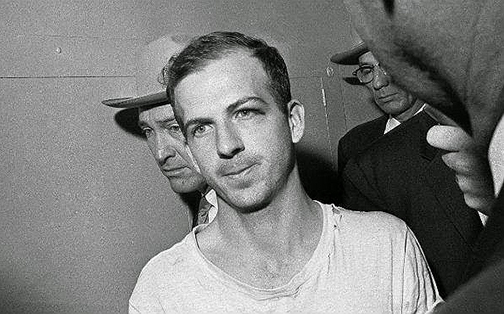 He among those who have described in books and lectures for decades the considerable scientific evidence that accused killer Lee Harvey Oswald could not possibly have fired the fatal shot killing Kennedy. His view opposes official reports by the FBI and Warren Commission parroted by the media since the day after the killing. 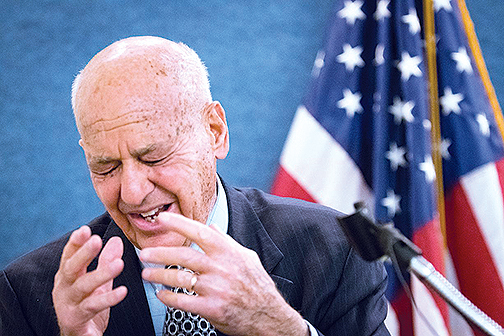 Wecht is shown below at a CAPA forum March 16 at the National Press Club (in a photo by Noel St. John) describing the overwhelming scientific evidence discrediting the mainstream media accounts of the JFK killing and the vital importance for the American people of document release and informed commentary. 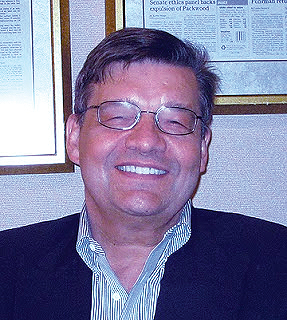 This editor has been active through the Justice Integrity Project, CAPA and elsewhere in advocating for these JFK document releases in cooperation with other JFK research groups and freedom of information advocates. Opposed are those claiming that "national security" should prevent disclosure of what are estimated to be thousands of pages of remaining classified documents, including those thought to be highly embarrassing to intelligence and investigative agencies that helped cover up the truth at the beginning and continuing to the present. Most media outlets also have advocated since the shooting a simplistic story claiming that former Marine Lee Harvey Oswald was a lone nut who fired three shots to kill the president with no help from anyone else. At this point, most of those outlets appeared this weekend to be featuring for commentary only or at least primarily those analysts who claim that new documents will simply reinforce the Warren Commission's original findings. Thus the information wars involve not just release of the documents but a fair opportunity for alternative experts to help the public understand the evidence. For such reasons, this column is segment 42 of the Justice Integrity Project's "Readers Guide to the JFK Assassination," whose previous segments are excerpted below with hot links to the lists of all major books, films, archives, plus interpretative articles. 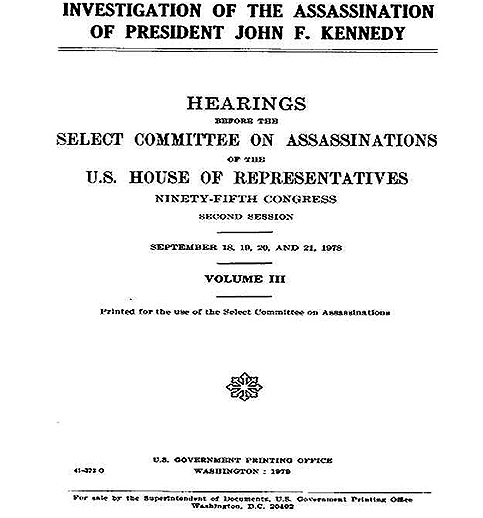 The Warren Commission led by then-Chief Justice Earl Warren issued a report in 1964 advocating that single-shooter theory, generating a long-standing debate that has resulted in more than 2,500 books on the assassination and vast numbers in the United States and around the world who do not believe the official story. 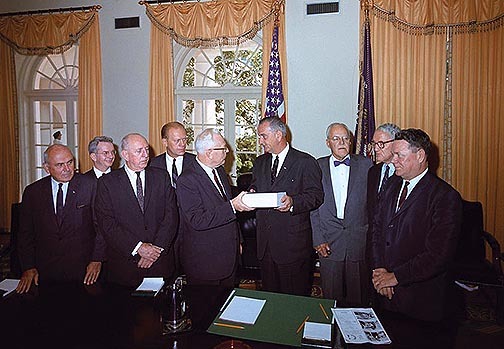 Warren is shown below at center left with other members of the commission and its chief counsel presenting their report to President Lyndon B. Johnson. 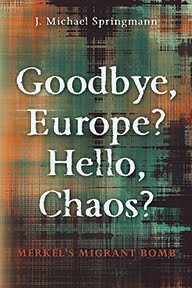 In March, this editor and CAPA organized a unique conference at the National Press Club of JFK research experts. The featured speaker was former Assassination Records Review Board (ARRB) Chairman John Tunheim, who was appointed by Congress to superintend a 1990s process to release pertinent JFK assassination records, culminating in last disclosures this Oct. 26. Also we published here a comprehensive summary of the experts advocating compliance with the 1992 "JFK Act" unanimously passed by Congress mandating complete release of documents by Oct. 26 of this year. That summary, JFK Experts Advocate Compliance With Records Release Deadline, showed that document release supporters come from across the political spectrum. They included Tunheim, his fellow ARRB members, former Reagan Administration Attorney Gen. Edwin Meese, and former House Select Committee on Assassinations General Counsel Robert Blakey, as well as several surviving members of the Warren Commission's staff. At issue are thought to be some 3,000 previously suppressed documents, and some 30,000 partially redacted documents, experts say. Some four million pages have previously been released. 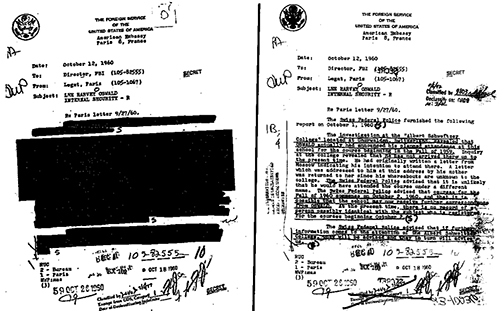 The CIA and to a lesser extent the FBI have been leading opponents of release through the decades. 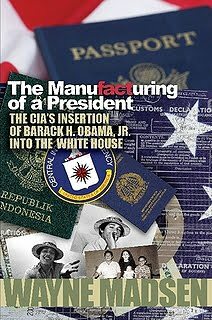 Researchers have speculated with increasing intensity for years whether the current president would dare release documents that power centers at the CIA and elsewhere have long resisted disclosing for reasons they do not describe much beyond the bromide "national security." Among those pushing the president to release documents were the president's longtime friends, Roger Stone and Jerome Corsi, both of them authors and journalists now associated with the Alex Jones Infowars network. In a board statement on Oct. 21, CAPA also extended its appreciation to U.S. 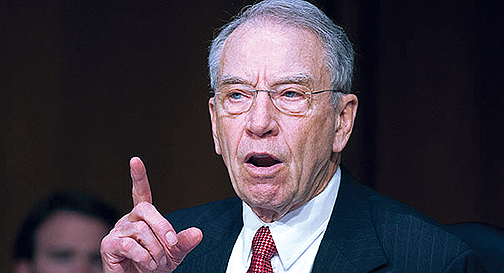 Senator Charles Grassley (R-Iowa, below) and House member Walter Jones (R-North Carolina) for their leadership in introducing S. Res 281 and H. Res 556 voicing congressional support for full document release. CAPA thanked also other early and prominent supporters of the bipartisan effort, including Sen. Patrick Leahy (D-Vermont), who is like Grassley a longtime leader of the Senate Judiciary Committee, and Reps. John Conyers (D-Michigan) and Elijah Cummings (D-Maryland), who have been leaders for many years of relevant House committees. Similarly, Assassination Archives and Research Center President James H. Lesar issued a Statement that praised Trump and other key leaders. Lesar also noted, however, that Trump left open the possibility that document releases might hinge on "receipt of further information." Lesar, an attorney who has long fought in the courts to release CIA and other key documents pertaining to the assassination, argued in his statement, "Post hoc justifications to further delay release are not warranted in light of the clear congressional mandate requiring full disclosure by October 26, 2017." 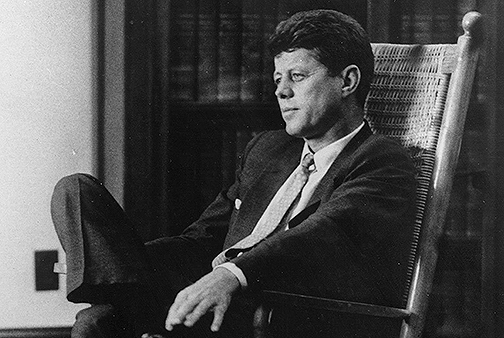 You have upheld values of transparency and democracy, and taken a courageous stand on the side of the large majority of Americans who for decades have expressed disbelief in the findings of the Warren Commission, according to public opinion polls on the topic consistently reporting such disbelief as ranging from the mid-60s to more than 70 percent of Americans. Release of documents over the needless objections of those obsessing over bogus "national security" implications also conforms with the views of many experts of diverse political views. These include such conservatives as former Reagan Attorney General Ed Meese, progressives, and several surviving staffers of the Warren Commission itself. My news report earlier this year summarized that impressive array of experts supporting the release that was announced today (JFK Experts Advocate Compliance With Records Release Deadline, published by the Justice Integrity Project and also by Citizens Against Political Assassinations (CAPA) at http://ow.ly/GQHW309IAGY). Right now, every American patriot should applaud President Trump for this action. 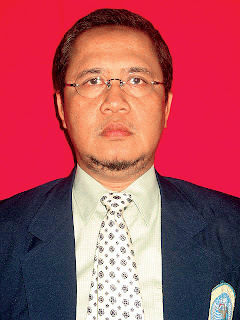 "This is a fine development, but we must be vigilant and skeptical. 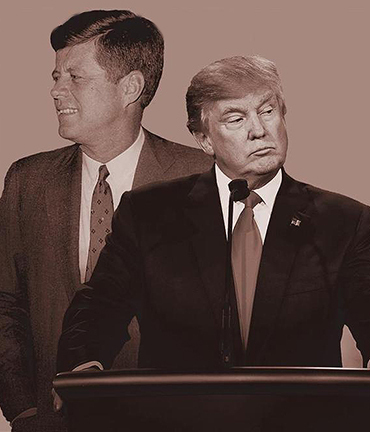 Why, for example, have many previously available documents apparently disappeared from the National Archives JFK collection, and will they be among the documents made available in this new release? If not we need to demand an accounting as to what happened to those documents. Most of all we need to be prepared for the inevitable mainstream media spin that is certain to accompany the release of these documents. 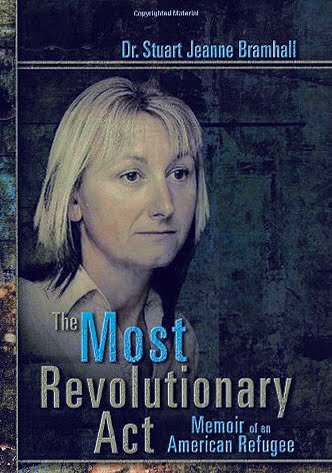 The media have propagated the lone assassin myth unrelentingly from the beginning in defiance of the actual evidence. This will undoubtedly continue regardless of what turns up in the newly released documents. The critical community will have a strong responsibility to get the word out about what is there and what it means — as well as to provide historical context." 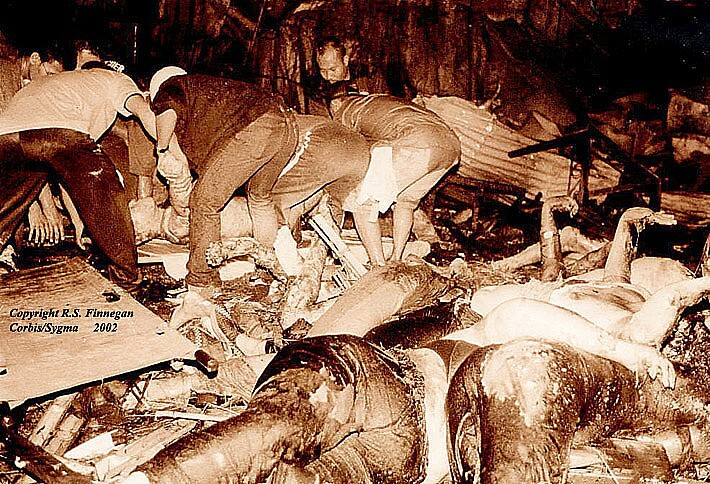 Most serious independent researchers believe that the main outlines of the assassination are already known via the previous document disclosures, witness statements, and more than 2,500 books. A central finding by CAPA supported by this editor is that Oswald could not have fired the fatal bullet, which raises the questions regarding why that secret had to be covered up — and why the secret remains important today. 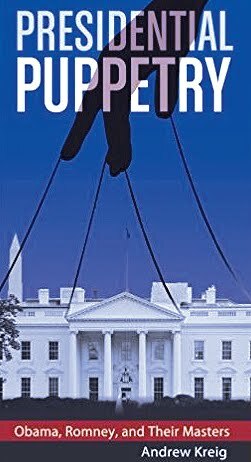 If Trump dares follow through on his apparent promise to smite within the next five days, by Oct. 26, that Gordion knot of silence and cover-up he will have shown more courage on the point than his predecessors. Regarding other specifics, all CAPA board members are available more specific comments to the media about these historically important developments. Those CAPA board names are here. Those in the media (including academia) seeking contact information should ask this editor via JIP or CAPA addresses for specifics. All readers here are encouraged to leave reader comments on media pages, keep others informed of your efforts, and air views otherwise on social media, including JIP and CAPA account buttons on websites.